There are greater evils in this world than white rice, but the refined, processed grain is by no means your strongest dining option. It’s time to rise above white rice, and get to know your whole grains – better for your digestion, your heart, and, we’d argue, your soul. Quinoa: A staple of the famously fit ancient Inca, quinoa is high in fibre and in blood- and muscle-boosting iron. It has a faster cooking time than pasta and is lower in carbs. 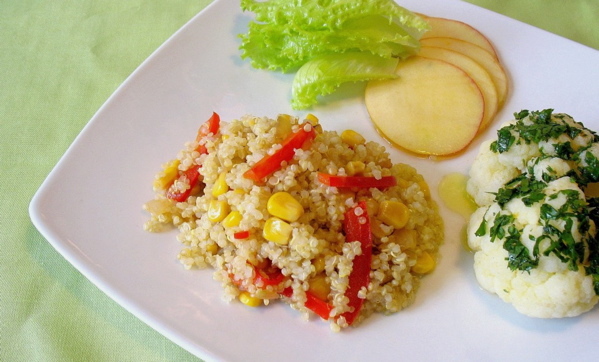 Recipe: Curry the quinoa and add mango for this delicious salad. Kamut: Thought to have originated in Iran, Kamut is technically a type of wheat. Use it in any recipe that calls for flour – to make bread, pasta, cereal and more. Recipe: Sub kamut into these banana, raisin and oatmeal pancakes. Buckwheat Grouts/Kasha: This Eastern European staple, which has a full-bodied, nutty taste, is predominantly used to feed cattle, horses and poultry in North America. Recipe: Blend it with portobello mushrooms to make this killer veggie burger; top it with chipotle mayo. Oats: Ditch the sugary Raisin Bran and opt for oats. They contain more soluble fibre than any grain, and they’re cheap and easy. Recipe: Add walnuts and flaxseed to make granola. Brown Rice: This nutty rice is un-milled, unbleached and more nutritious than its white cousin. Recipe: Make a chicken stir-fry flavourful with brown rice, like this one with edamame and walnuts. Photo courtesy of bricolage 108 on Flickr.